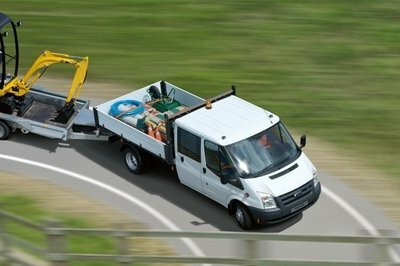 The Ford Transit Chassis Cab is available with a variety of models and can be converted in a wide range of commercial vehicles from ambulances to tippers. The lightweight truck was designed to offer a sharp handling around the city and also comfortable long-distance cruising. The cabin is spacious, comfortable and well equipped while the engine range is pretty wide too, with plenty of units to choose from. 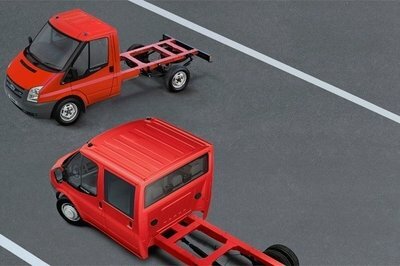 The Ford transit Chassis Cap has a starting price of £18,670 (ex. vat) and is available with three wheelbases, four frame lengths, rear- , front- or all-wheel drive, high-traction dual and single wheels and single or double cab style. 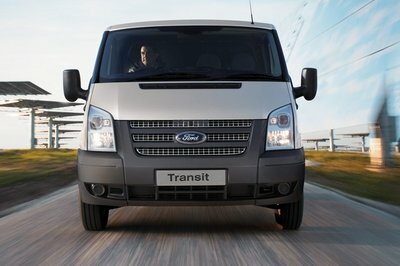 Unlike other trucks in the segment that have a more modern design, the Transit features a conventional appearance without any fancy design element to make it stand out from the crowd. The truck features a conventional cab configuration with a big front grille traversed by three horizontal bars. The bonnet received two dynamic creases which flow towards the grille forming a nice pattern which gives the front end a sense of unity. The black spoiler is well integrated and serves as a base for the vertical light clusters which add a bit of dynamism to the entire truck. The bold, modern exterior was also specially reinforced to offer all-round passive protection. The cabin offers plenty of space and it is fitted with a lot of storage places, cup holders and cubby holes to make you feel like home. We also like the dashboard design which even if it could look a bit spartan for some eyes; it is highly efficient and well organized. However, we find the HVAC controls a bit too far to be reach without problems, but other than that, the rest of the buttons and switches are pretty well placed. The short gear knob is also well placed and pops out from the dashboard being easy to use and ergonomically designed. The instrument cluster is fitted with two huge main gauges which can be read easily, while the central rectangular display is bigger than we’ve expected and can be read effortlessly. The instrument cluster is also fitted with a Shift Indicator which lights up for a short period of time to let you know you that shifting gear can be more fuel-efficient. Luckily, the Shift Indicator won’t light up during high acceleration, braking or when the clutch pedal is pressed. The driver and passenger sit high from the ground on pretty thin seats with poor side support. The driver’s armrest is a luxury that the front passenger won’t get, but there is plenty of head and leg-room for everybody as the truck can accommodate up to three people on the front row of seats. The material used for the dash and doors is hard, cheap-feeling textured plastic that sounds hollow when tapped with a finger and wind noise enters the cabin without any shines. However these problems can be found of most trucks in the segment and we won’t complain to o much about them. 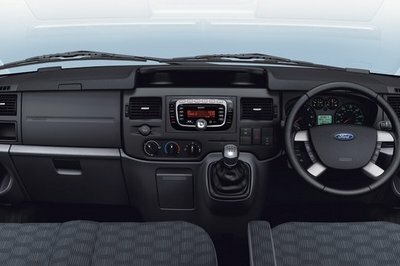 The Transit Chassis Cab will definitely surprise you with its long list of features available which include cruise control, trip computer, leather wrapped steering wheel, leather gear knob, Bluetooth wireless connectivity, electrically operated and heated door mirrors and air conditioning. In the safety department, a driver’s airbag is standard while front passenger and side curtain airbags are available as an option to enhance protection. There’s also a strengthened front seat pedestal and seats that incorporate three-point lap and diagonal seat belts plus individually height-adjustable head restraints. 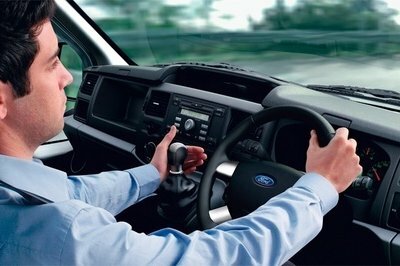 The Ford Transit Chassis Cab is powered by new 2.2 Duratorq TDCi diesel engines which are combined with Ford’s ECOnetic Technologies to lower the cost of owning and keep the emissions to a minimum level. These engines meet the Euro V emissions standards, while still producing significantly more power and torque than the previous line up: from 100PS/310 Nm to 155 PS/385 Nm. The engines aren’t exactly the smoothest in the segment but they have plenty of power and can deal well with almost anything you throw at them. The Auto Start Stop system is working in conjunction with the Duratorq engines, in order to lower the fuel consumption and CO2 emissions in heavy traffic. The system automatically switches off the engine when idling, then re-starts it the instant you touch the clutch. Considering that a vehicle’s engine is rarely used continually on city journeys, this fuel saving technology makes perfect sense in the real world. Moreover, the light truck is also fitted with Smart Regenerative Charging. When you slow down, this technology creates electrical energy that charges the vehicle’s battery. Unlike conventional systems it only charges the battery when needs it, which can help save fuel and reduce emissions. The Transit range is equipped with a smooth-shifting 6-speed manual transmission which is easy to use and offers a sharp response with good gear ratios. The suspension and steering feel a bit out of place and the vehicle has a pretty big body roll. The front independent MacPherson strut suspension and rear multileaf spring setup, both with stabilizer bars, feel unsettled without a serious amount of load on their backs. The suspension could be more settled-down when burdened with weight, but unladen it feels flimsy. The light and uncommunicative steering doesn’t do anything to make things better and requires corrections that only accentuate the vehicle’s height and body roll. Luckily, you won’t have any complains about the disc brakes as they can do their work without thinking twice. The Electronic Stability Programme, incorporating anti-lock braking system (ABS), senses any slight deviations from your chosen driving line and automatically corrects the Transit’s road position - helping you remain in control. The vehicle is also available with Emergency Brake Assist (EBA) and Hill Launch Assist (HLA). When you’re making a hill start, this system prevents you from rolling backwards. It works by keeping the wheels braked, after you’ve released the brake pedal, helping you move away safely. The Ford Transit chassis cab is one of the most fuel efficient trucks in the 3.5 tones segment. 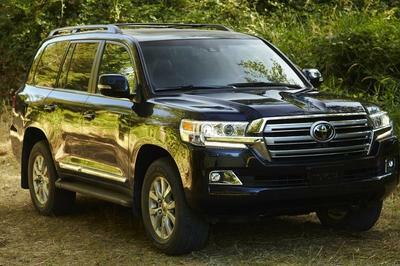 Despite its efficiency, the vehicle has enough power under its bonnet to get the job done without too much drama, while its various number of wheelbases and cabs make it highly versatile. 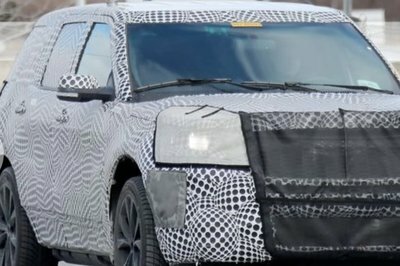 The ride and handling may not be the best in the business, but it will be hard to find a chassis cab model that is able to score high marks in this department, so it can’t be considered a very big issue. The cabin is also built according to the vehicle purpose and is fitted with plenty of useful storage places and many features to make your life on road easier.